Meet Lynn Mooney (Lalitatirtha). 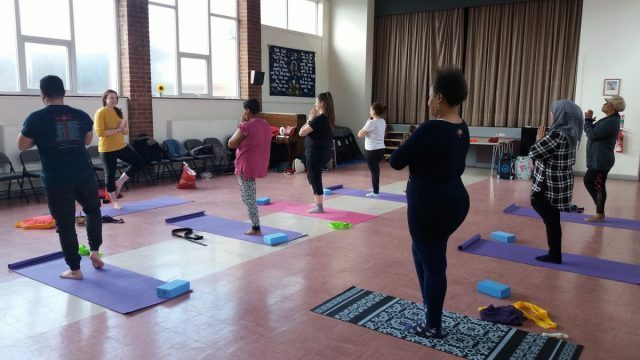 She is our energetic Tools for Inner Peace teacher who has launched four new refugee yoga classes across Liverpool since summer 2018. “My immersion in yoga and spiritual life began in 2010 when I went to live for two years at the Anahata ashram in New Zealand. The emphasis there was on serving others. We ourselves had warm comfortable beds, nourishing food and daily yogic practices. Even the hard mental struggles I went through in the ashram had a beauty to them; they allowed me to grow a little more and to release and let go. The holistic lifestyle of the ashram turned my life around completely. I wanted to offer the experience of yoga practices to others, so in 2015 I began my training to teach yoga at the Mandala ashram in Wales.